Fish Christmas Island, Kiribati with Gary Kemsley Group Fishing Tour | travel&co. Discover the fly fishing paradise of Christmas Island with these 2020 group tours. Fishing host, Gary Kemsley has fished Christmas Island 7 times and knows this destination extremely well. With over 610 km2 of aqua lagoons, endless hard sand ﬂats and great all year round weather, this remote Paciﬁc atoll in the Kiribati Islands offers the ultimate saltwater ﬂy ﬁshing experience. On this guided ﬁshing adventure you will spend each day with a local guide wading across the ﬂats stalking the amazing boneﬁsh, taking on bluefin trevally, triggerfish or giant trevally. All ground and water transport, WiFi, and laundry service. Booking agent is travel&co and the Christmas Island trip is hosted by Gary Kemsley. Trip price is based on per person (pp), shared room in NZD and for a selected travel period only. A NZD $500 deposit is required at the time of booking, with final balance due 90 days prior to departure. Fisherman. Author. World Record Holder. Fishing Ambassador. Experienced Tour Guide. 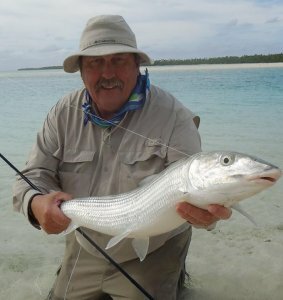 Gary comes highly recommended with a wealth of experience in tour guiding, fly fishing and hooking bonefish. Not only has he fished in the amazing waters of Christmas Island, his most recent bonefish catch was a massive 14lber and 83cms long. Released (as all bonefish are), he likes to believe this fish is living out its life in the beautiful lagoons of the South Pacifc. His expertise, experience and enthusiasm for guide fishing will ensure you have the fishing experience of a lifetime.